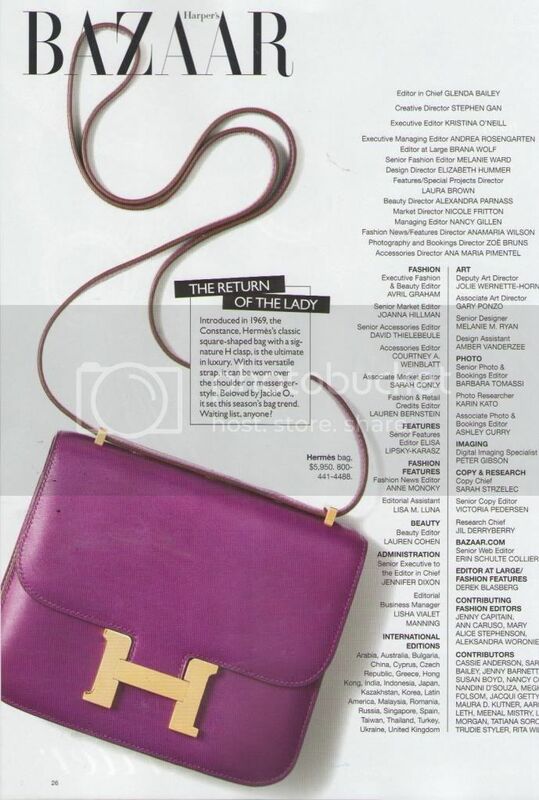 The Hermes Constance hand bag is spotlighted in the June/July Issue of Harper’s Bazaar, properly titled The Return of the Lady. 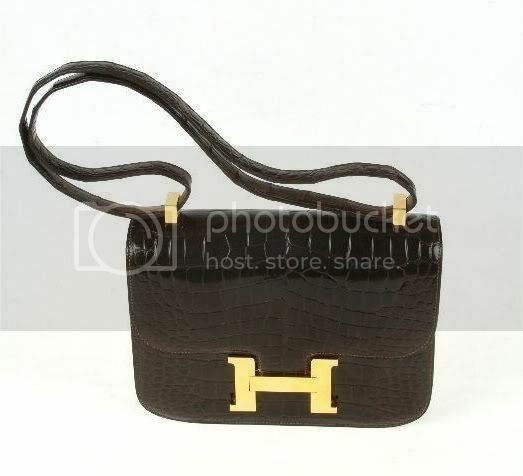 The classic square-shaped hand bag, with signature H clasp and versitile strap, was released in 1969 and famously worn by Jackie O.
eDrop-Off has a fabulous Brown Crocodile Hermes Constance Bag on sale now in the eBay boutique. Hurry though, because the auction closes at 4 PM on June 11. 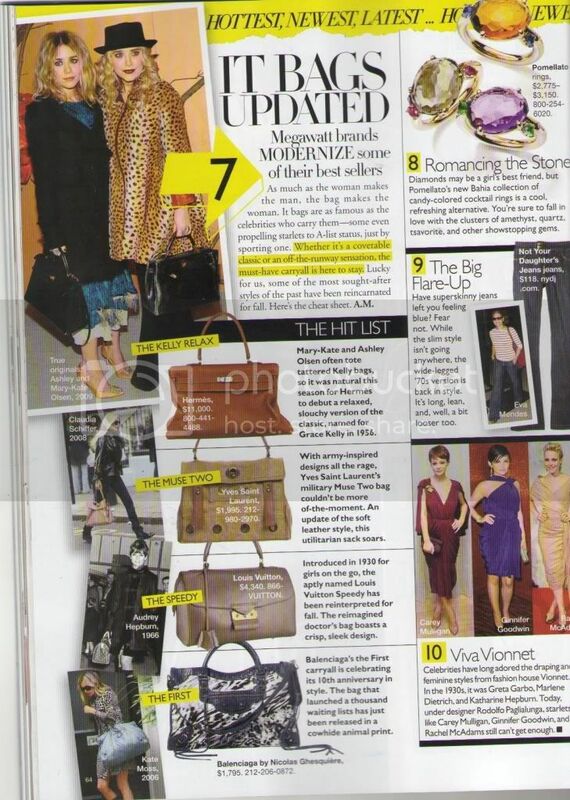 In that same issue of Harper's Bazaar, we also loved the It Bags Updated article regarding the modernization of some of fashion's best selling hand bags. Starting off with the famous Hermes 'Kelly' bag, seen carried by both Mary-Kate and Ashley Olsen, will be debuting the 'Kelly Relax' a slouchier version of the classic structured bag. The article wraps up with our second favorite handbag revision, the 10th anniversary edition of the Balenciaga carryall. The new bag will be released with a cowhide and animal print variation. When you think of a bridal gowns, do brown, blue, green, red, and black come to mind? Well, these colors were all used in designing bridal gowns prior the nineteenth century. That being said, over time, wedding traditions have undergone a metamorphic transformation into what we know them as today. 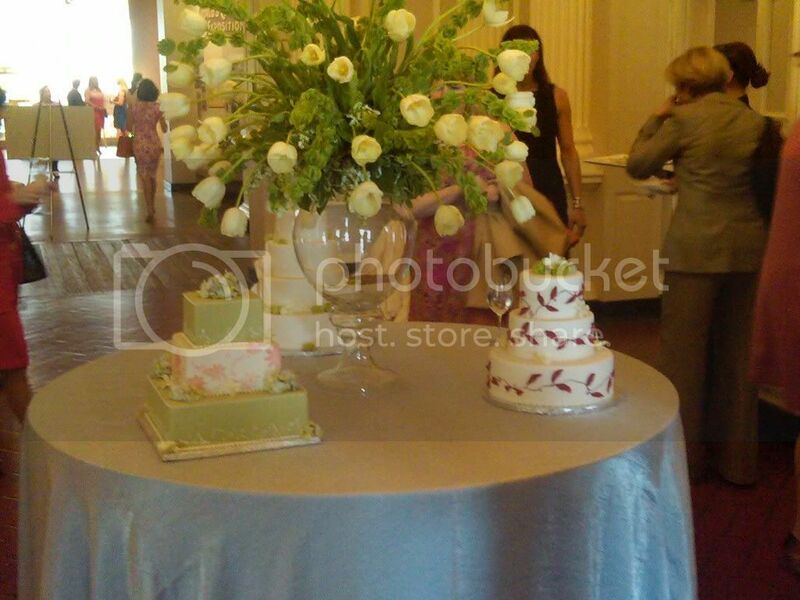 Wedding celebrations are planned with history and tradition in mind, and the new “I Do! Chicago Ties the Knot” costume exhibit at the Chicago History Museum explores the fashion behind them. Using 150 years of historical bridal gowns, the exhibit showcases how Chicago retailers had a hand in shaping the wedding industry into what we know today. 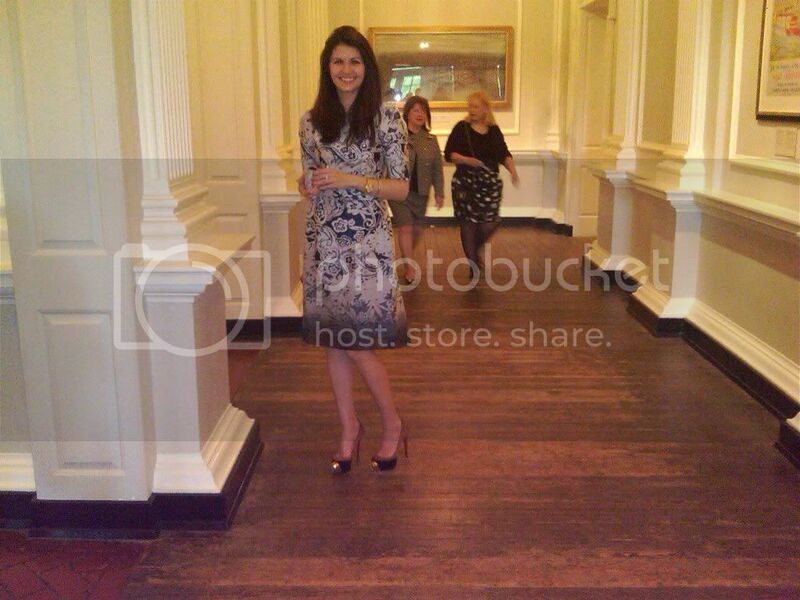 Corri and Nicole were invited to a private viewing of the exhibit as well as a sophisticated bridal inspired luncheon. 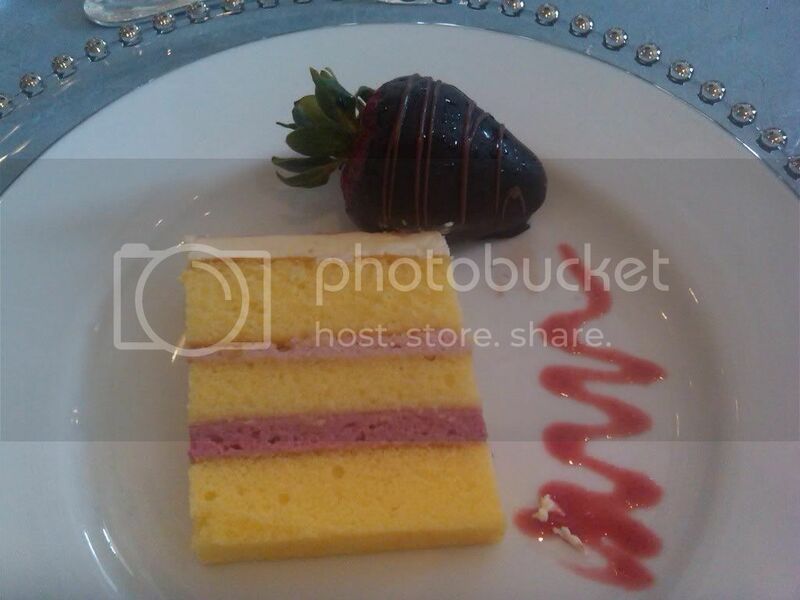 The luncheon was decorated to emulate a fabulous wedding reception; incorporating Christian Lacroix designed water bottles, elaborate table centerpieces, and food which tasted as wonderfully as it was displayed. “I Do” showcases forty-five dresses, accessories, corsets, men’s attire, and—after June 24—the winning dress of the FashioNext. Some of our favorite pieces from the exhibit included this 1950s orange taffeta dress by Arnold Isaacs (below center) who has also dressed several first ladies. Also pictured above, is a contemporary gown from 2003 designed by Cat Chow which is made entirely out of one long zipper (left); and 2 dresses from the 1920s designed by a downtown Chicago couture salon. They are made of silk, satin, chiffon, and hundreds of glass beads carfully placed together. The famous high heel shoe brand, Jimmy Choo, is releasing a capsule collection of luxurious high and low-top sneakers in their Trainers Collection. As quoted, “even sparkling starlets need to take a breather from their stilettos every once in a while” but never compromise style. These exquisitely designed sneakers incorporate suede, exotic snakeskin, and gold hardware; which fit perfectly with the Jimmy Choo style. Jimmy Choo Trainers are ideal from running errands around town, or for stylishly laid-back weekends. Pair these sneakers with denim, shorts, leggings, and other work-out wear; grab your favorite zipper hoodie and get going! eDrop Off currently has 2 Eugenia Kim for Target hats on sale right now. One is black with black jeweled trim around the crown and the other is tan with woven black detail. It features royal blue grosgrain trim at the crown with a green parrot accent and black grosgrain trim around the brim. They have never been worn and still have their tags attached. These items com in a set of two (2), with a starting price of $18.99! Click here to read more about Eugenia Kim and her capsule collection, Eugenia Kim for Target. View the Eugenia Kim for Target hats on sale now in our eBay store. This auction will close on Monday, May 24 at 1 pm CT.
Last week eDrop-off Owner Corri McFadden attended the 6th Annual Tails in the City Anniversary Party, where they launched a Doggie Model Search Contest. The winner gets a chance to appear in a national ad campaign for Scooter's Friends, a feature on Tails in the City, an exclusive poster, one night stay at Affinia Chicago for dog and owner, a Tails in the City gift certificate, a Bobbi Panter Gift Basket, and a Stella & Chewy's gift basket. 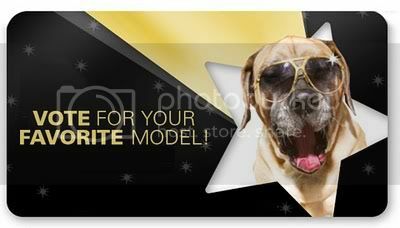 Corri's very own Harley had his photo taken for the contest! 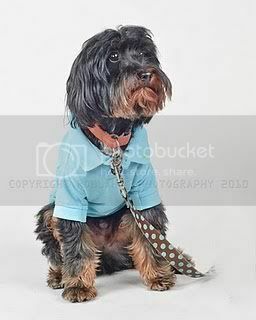 Vote for Harley to win on the Tails in the City blog. Anyone can vote, but the poll ends Friday, May 21, 2010. The benefit to buying and selling your designer items through eBay is that it reduces your ecological footprint. It also doesn’t require any additional factory production and there is dramatically less paper use involved with online purchasing. Recycling has never been so stylish! Here are some additional ways to be eco-friendly in 2010 and reduce your personal ecological footprint. 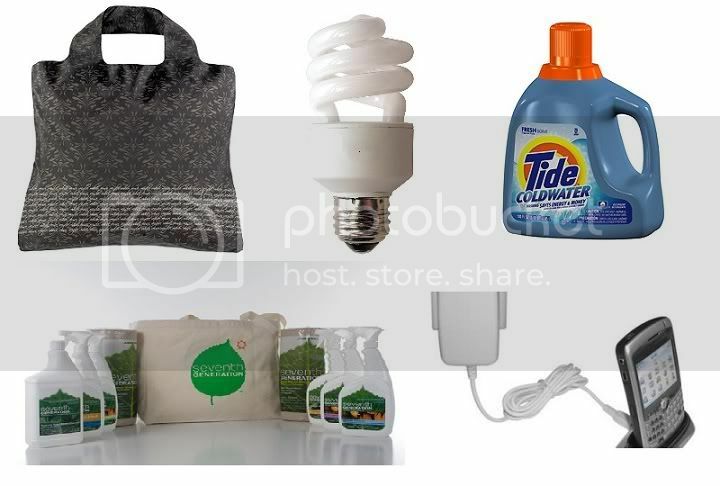 Each year retailers spend over 4 billion dollars on single use bags, which is considered a packaging expense and later gets filtered down to consumers. In addition to that, plastic bags add 8 billion pounds to our landfills each year. Try using one of these stylish re-useable bags from Envirosax; They hold hold up to 44 lbs and they come in a variety of designs. The best part is that you can roll them up to fit in almost any sized hand bag. CLF blubs are a bit more costly than traditional light bulbs, but they last up to nine times as long. In fact, if every U.S. family replaced one regular light bulb with a CFL, it would eliminate 90 billion pounds of greenhouse gases. That’s the same as taking 7.5 million cars off the road. CFL bulbs fit into all the same sockets as incandescent bulbs, meaning you can put them in your walk-in closet or that swanky new lamp you just bought. Washing clothes in cold water saves $3 billion in energy costs annually. In addition to that, it’s great for your clothes! It helps maintain their shape and color longer. If you have some tough stains you’re trying to get out, try buying a cold water detergent that activates in the icy water. Non-natural cleaning products are bad for you and the environment. They contain harmful chemicals which are harmful to breathe in and do not get filtered from landfills; which end up creating toxic waste. Brands like Seventh Generation even make laundry detergent which is free of dyes and perfumes, which is gentler on your clothing. Before you leave the house, unplug your cell phone changer, hair straighter, and any other electronics which are not being used. Even though they are off, they continuously drain electricity when they are plugged in. Instead of lighting an entire room, only focus the light where you need it. This will not only save energy, but also create a more relaxed ambience. Check out our recent spotlight article on Second City Style! Live in Chicago or NYC? Schedule a FREE at home pick up or closet consultation. We'll send you a prepaid shipping label so you can send us your items for free! eDrop-Off is the nation’s premier designer consignment store to buy and sell new and gently used authentic designer clothing, handbags, shoes, jewelry and accessories. © 2019, EDrop-Off, All rights reserved.